Websites have been around for years. Yet there isn’t a definitive list of best practices. Why is that? 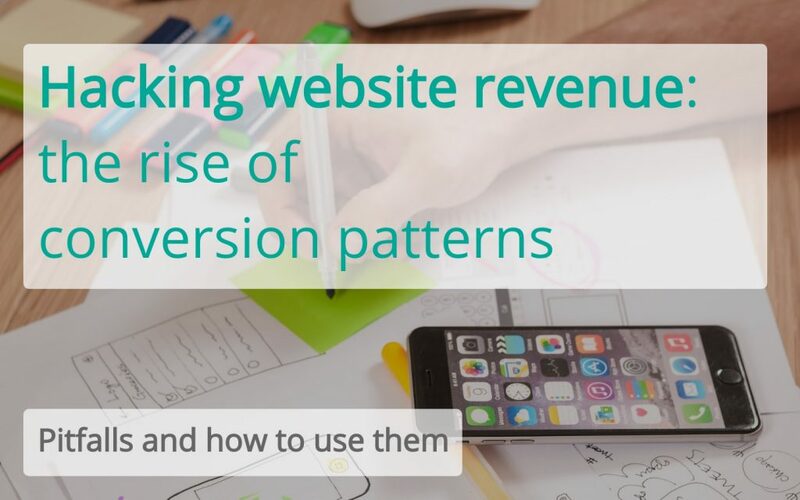 In this article I explain how to use conversion patterns to really maximise revenue on your website. What is a ‘conversion pattern’? A conversion pattern is a user interface (UI) component that has worked in a previous A/B test(s). It’s an easily-repeatable UI change you can make on your website to improve conversion, leads or sales. It could be a positioning of a call-to-action button, use of an incentive, weak headline, inauthentic photo, etc. The rationale is that if it worked on another website it will work on yours. At least, it’s more likely to work on yours. The benefit here is obvious: conversion patterns are shortcuts. Rinse and repeat. A/B testing is hard, many experiments fail. So it makes sense to exploit any existing knowledge for more successes and fewer failures. CXL have started doing just that. And Good UI Fast Forward exists for this very reason. How useful are conversion patterns? Can they be used to improve your website to a higher standard and address ‘quick wins’? Can you have your cake and eat it? The rub is that your business is unique. Your processes are unique. Your audience is unique. Your website is unique. That’s precisely why undertaking conversion optimisation – the practice of converting more website visitors into customers – involves collecting research, understanding what’s happening, and why it’s happening. To you. The biggest conversion wins will always originate from data-driven insights from the user. The inconvenient truth is that the most successful optimisation is data-driven and based on user psychology. Copying other people’s design has its limitations. Conversion patterns – should you use them? Yes! With caveats. When persuading users to take action on websites, we should steer clear of ‘best practice’ because nothing is universal. What works on your website may not work on mine. What, then, is the difference between a ‘conversion pattern’ and a ‘best practice’? Does the emperor is wear new clothes? Not entirely. A conversion pattern has the distinction of having worked at least once in an A/B test. A conversion pattern is superior to best practice. However, context is crucial. What type of the website was that A/B test? SaaS? Lead-gen? Ecommerce? Retail? Travel? Insurance? The reality is that many conversion patterns don’t apply to your website. Conversion patterns have a seat at the CRO (conversion rate optimisation) table – but don’t use them as a substitute for data analysis. And bear in mind that conversion patterns all have their route in user psychology. Don’t copy blindly. The danger is focusing on cheap UI tricks rather than truly understanding the user. Understanding why a conversion pattern worked in a given circumstance, that’s the path to true growth. If you’re interested in learning more about conversion patterns, and generally how to leverage CRO techniques to maximise revenue on your website, schedule a quick 1-2-1 call with me here.